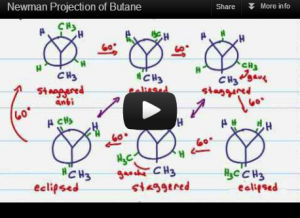 This tutorial video shows how to draw a Newman Projection from a Sawhorse Projection of the butane molecule, starting from both staggered and eclipsed conformations. Also explained are the different energy levels attained my rotating the molecule in 60 degree increments to 360, and plotted on a potential energy diagram. This is Video 2 in the Newman Projection Video Series. Click HERE for the entire series. the video was great but i have one question at the end when graphing the front of molecule the ch3 was position on top but before it was position at the bottom. I am so grateful that you did this series, it had really helped me a lot. It helps you understand it instead of memorizing what is going on.